Is it okay to admit that I've never cooked with rhubarb before this summer? I know that it is strawberry's perfect partner and it symbolizes spring as much as fiddleheads. Perhaps I was just too timid to reach for those long pearly pink stalks at the produce section. Or perhaps they simply never look terribly fresh at my local grocery stores! Well, this summer, my CSA changed all that. For the last three weeks since the summer program began, I've been bringing home a beautiful bunch of rhubarb every Wednesday. I didn't exactly dive off the deep end in week 1. 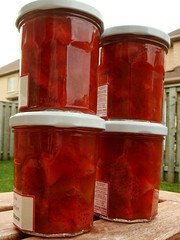 Instead, I chose a safe and very easy option: compote! I turned to smitten kitchen for inspiration and Deb did not disappoint. 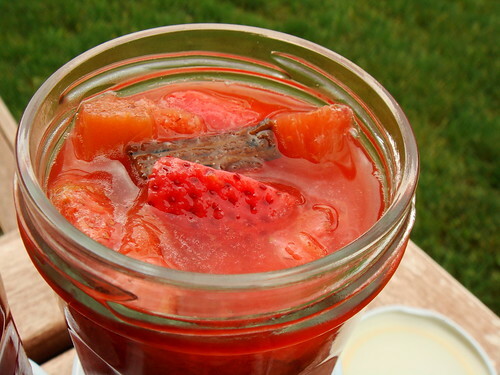 Her adaptation of Thomas Keller's Strawberry Rhubarb Compote was fresh and tasted like spring. I added an empty vanilla pod too just because I love the heady fragrance of fruit poached in vanilla. It made me happy just to stare at those ruby little jars. If I'm a more avid foodblogger, I would probably start telling you how I enjoyed this lovely tangy sweet compote on all the cakes, parfaits, or french toasts that I made. Well, I would have a few years ago. But the truth is it is in the middle of race season and I'm carefully watching my diet. Just eating the compote spoonful by spoonful is very much a treat in itself. It was delicious all on its lonesome. Last week rhubarb was not part of the regular share but strawberries were. It was the first batch of local strawberries from the Kawartha region and I couldn't be more excited. I got a bunch of rhubarb as extra just to keep the strawberries company! What I conveniently neglected was my weekend road trip to Pennsylvania. Days away from home not only meant less time to cook, it also meant meals eaten away from home. I couldn't possibly let the gorgeous strawberries and rhubarb languish in the fridge while I munch away on Philly Cheesesteak miles away. What to do? I did what any sensible cooks would do. 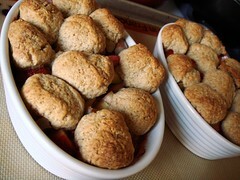 I woke up extra early on the day of my road trip and made a strawberry rhubarb cobbler for the road. The recipe came from Dorie Greenspan's Baking From My Home To Yours. I adapted her rhubarb cherry cobbler to use strawberries and baked mine in two adorable oval baking dishes instead of one 8-inch square dish. Some people say you eat as much with your eyes as your mouth. My eyes and mouth agree. The whole wheat flour added a bit of nutty flavour to the dumplings which were perfect to soak up the juicy fruit filling. So what about that "for the road" part? Well, I drove all the way from Toronto to Philadephia with a dish of cobbler sitting comfortably on the passenger side. It was hostess gift for B's parents who generously hosted me over the weekend. I did mention the cobbler was juicy, right? Well, being the resourceful one, of course I came up with a cute and practical way to transport the dessert while I concentrated on traffic. The only distraction was the delicious smell! After compote and cobbler, I was in need of inspirations when I came home with yet another bunch of rhubarb and a basket of strawberries this Wednesday. At this point, you may wonder about the conspicuous lack of pie on this post. Isn't it the first thing that comes to mind at the mention of strawberries and rhubarb? Bottom line is that I'm avoiding it. I'm pretty good at making pie dough but hate the clean up part. Besides, with such a juicy filling, chance of a soggy bottom is quite high. I looked and looked but all I saw was pie, crumble, cobbler, and compote. Surely there must be something more intriguing out there! Thankfully Gourmet magazine came to rescue. 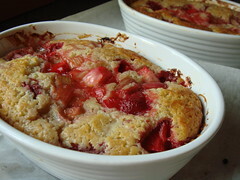 In their April 2007 issue, there was a recipe on Rhubarb Strawberry Pudding Cake. The photo looks a bit dowdy but I was sold as soon as I read "pudding cake". I adore pudding cakes. I have such fond memories from my teenage years of making these one dish dessert that magically bake into cake with sauce. I adapted the recipe to use much less sugar, with some ginger and cardomom thrown in. When fresh out of the oven, this pudding cake smelled fantastic. The spices are not in your face but just enough to add an intriguing element. Needless to say, this dessert is best enjoyed warm with something creamy. For a decadent breakfast, go for whole milk yogurt. Snack? A dollop of creme fraiche. Dessert? Vanilla ice-cream. Of course. Preheat oven to 400F. Grease a 8-inch square glass or ceramic baking dish or use two dishes that add up to about the same volume as the square dish. In a small sauce pan, combine water, cornstarch, and 30g of sugar. Add rhubarb and cook over high heat for about 3 minutes. 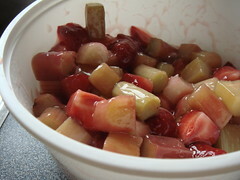 Stir often to ensure fruit is coated evenly with the liquid. 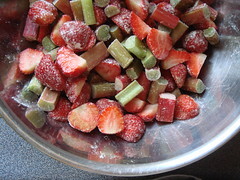 Remove from heat when the liquid has thicken and rhubarb pieces are soft but not mushy. Toss with strawberries and set aside. In a large mixing bowl, whisk together all the dry ingredients including flour, 50g sugar, baking powder, salt, ground ginger, and ground cardomom. In a small mixing bowl, stir to combine egg, milk, butter, and vanilla extract. Pour liquid ingredients into dry ingredients. Gently stir until just combined. Do not overwork the batter. Reserve 1/2 cup of fruit filling. Divide the rest into baking dish(es). Top with the cake batter and finally the reserved fruit filling. No need to mix anymore! The cake will sort itself out during baking. Some of my friends are recently gaining a lot of interest in the way food is produced, the effects of modern western diet, and subsequently making some significant changes to the way they eat. I think it is a positive sign that people are getting more aware of their food choices. Personally, I have gone through a similar phase and thus made my own conscious decision on how and what I want to eat. What is most curious to me is although my friends and I share similar knowledge on the negative effects our old eating habits, our new choices cannot be more different. I've never been much of a meat-eater myself. As my diet evolved, I'm inspired by people sharing similar food preferences as myself. 101 Cookbooks and Ottolenghi have been constant sources of ideas and encourage me to branch out to unfamiliar flavours and ingredients. Joining the Kawartha Ecological Growers CSA is another turning point. 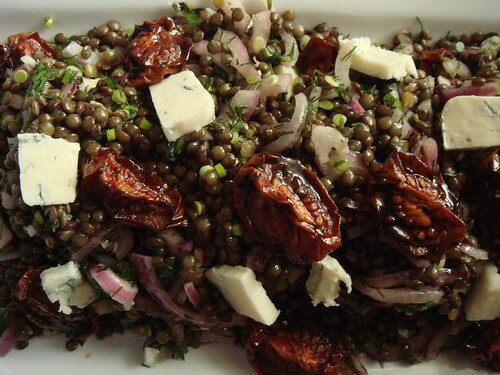 Getting farm fresh produce on a regular basis opened my eyes to the wonderful ways food ought to taste. I am thrilled to prepare flavourful meals with plenty of fresh vegetable, beans, pulses, eggs, dairy, whole grains, herbs, and spices. I don't go out of my way to avoid meat but the truth is I'm just more excited about the non-meat choices. Whole food, unrefined carbs, locavore, flexitarian...those buzzwords are cliches yet they do describe pretty accurately of the way I eat. On the other end of the spectrum, my friends have chosen a diet heavy on fats and proteins from naturally raised animals. The usual suspects for "superfood" such as goji berries, coconut milk, seal oil capsules are often mentioned in conversations. Our food choices are complete opposites yet they do share one significant trait: shunning processed food in favour for whole foods farmed/raised/produced the traditional way. Personally, I don't think one is better than the other. I believe both diets are beneficial to the body. It comes down to a personal tastes. I cannot bring myself to eat (nor cook) meat, meat, and more meat. I truly enjoy all the varied choices nature provides. Our differences often bring about interesting and at times heated discussion. I keep a food log religiously so I can keep track of my caloric, micro-, and macro-nutrient intake. I know that due to the amount of exercises I do, my appetite can easily get out of control and so can my body weight. One of the side benefits of all the fruit and vegetable I eat is that they are nutritionally dense yet low in calories. My stomach gets the sense of satisfaction it craves from the bulk (aka fibre). I get tsk tsk from my friends often about all these carbs that I eat. At the same time, I roll my eyes at them for their daily mid-day coconut milk smoothie. That's at least 500cal in that "snack", a quarter of daily caloric need for a not very active adult male. My vegetarian-leaning ways draw comments like the human body is not intended to function optimally on such diets, along with offers to lend me books and research papers that back up their side of argument. Sometimes, we just have to agree to disagree. And then there's my boyfriend B who also has a demanding training regimen. He did his share of reading too and has developed his own eating habit for what he believes is best for him (as an aside, isn't this what we're all trying to do? Doing what we believe is best for us?). The first time I visited, I was astonished at the endless bottles of pills and supplements and protein powder all wash down with raw milk. Well, at least the raw milk is really really good. I wouldn't be caught dead putting any of those other things in my mouth. He supplements this with apples, farm-fresh eggs, and the occasional grass-fed beef pattie. As he doesn't cook nor like vegetable, his diet works for his lifestyle. Suffice to say, my first and mandatory stop whenever I visit is the farmer's market! It's a good thing that the DC area is abundant with farm-fresh goodies from neighbouring Virginia, Pennsylvania, and Maryland. The running joke between B and I is that he must like me a lot for eating all the vegetable dishes I cook. That's right, I fed him kale on Valentine's Day and swiss chard on his birthday. I think the food we choose to eat is a very personal issue and we easily get defensive about it. For anyone who is mindful of the way he eats, food choices truly reflects an important part of his life. I choose to eat the way I eat because I believe that it is good for me and/or I find joy from the food. I think it is rare that given the choice, a person would choose to eat things that they neither enjoy nor believe it's good for them day in and day out. This conscious decision is what makes food choices such a personal one.